Attached is a photo of the target I shot yesterday. It might be of interest to other small caliber shooters. The 9 low at 7 o'clock came from nowhere. The last 5 shots were all low as we used numbered pasters. Pull and mark after each shot. I am going to give it another try this evening. 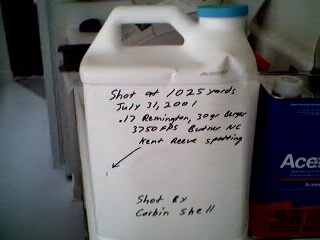 I am also going to try and shoot a kitty litter jug at 1025 yards. It holds 20 lbs of kitty litter and looks like it will hold about 2 gallons of water. Will let you know the results. The 1025 yard jug shot became a reality yesterday evening. First off I wanted to confirm my 1000 yard no wind zero on my Palma rifle. The flags were still and only a trickle of mirage running from right to left. It was worth on min of right windage on the palma rifle (10"). The palma load pushes a 155gr Sierra at 2950fps. After shooting the palma rifle I set up the .17 Remington/Nesika rifle. Front and rear rest were used and shot prone (F-class). The rifle was shot the day before and I had established a good 600 yard zero. There was no need to shoot any closer than 1000 yards. I spun on 42 min of elevation and figured at least twice the windage would be required as the palma rifle so 2 min of right windage were added. After lining up on the 1000 yard target I called down on the radio to Kent Reeve and gave the warning. Bang the target goes down. The first shot out of a cold clean barrel landed in the X ring on the left side. The next two shots were misses high over the target. I came down 4 min. The forth shot was an 8 high, windage was good. The crosshairs were moved to the jug on the hill in the impact area. The jug was 25 yards behind the target. The first shot went about 3 feet low. I adjusted accordingly. The rifle took several shots to settle down before it started holding better elevation. Kent Reeve was calling up elevation and windage corrections. Shooting was fast and furious. 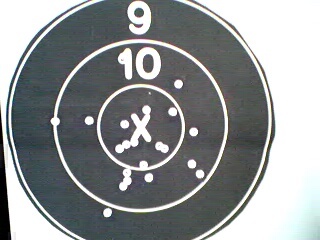 The aiming point was from center right to 4" high and 4" right. I was able to see the impact of shot 9 or 10 through the 36x scope. A miss just low and left. Shot number eleven connected !!!! I saw the blue cap pop off and the mission had been accomplished. The jug was hit half way up and on the far left side. Jug dimensions are 13.5" tall, 9" wide and 6" thick. 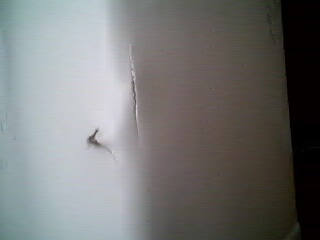 Interestingly enough the projectile passed all the way through jug, which was full of water (6"). Terminal velocity is estimated at 890fps using the Ohler ballistics program. Kent was able to retrieve the projectile which was imbedded in the wet sand about 3". 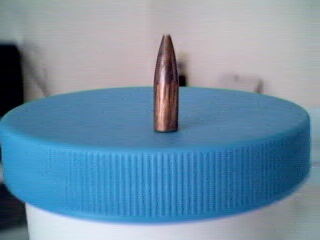 The projectile was not deformed except for rifling marks.